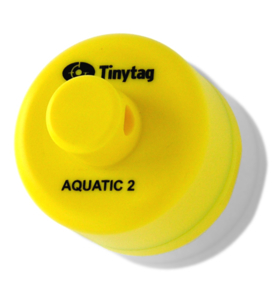 Tinytag Aquatic 2 loggers monitor underwater temperature in prolonged, deep or turbulent conditions. The Aquatic 2 underwater temperature data logger has developed its functionality alongside the ever-increasing demand from environmental researchers and resource managers for a highly accurate, practical and easy to use underwater data logger that can be relied on for long term immersion 24/7, in the harshest of conditions. In order to match raising expectations, one of the Aquatic 2's key features is the ability to store 32,000 readings, which allows the user to leave the logger in place and recording for longer periods, a key benefit for many temperature data logger users whose research applications involve long term monitoring. Another important feature concerns temperature data output and analysis. The Aquatic 2 offers a higher resolution of 16-bit to provide smoother graph read-outs, enabling spikes and dips to be clearly seen. It also allows for the clear comparison of multiple logging runs or multiple loggers, using the comprehensive overlay features, which are a distinctive feature of the popular Tinytag Explorer Software. The Software has simple, effective navigation features that allow for zooming and scrolling through data. Tabular and information views, in addition to graphical, can also be selected and be exported to Microsoft applications such as Excel or Word. The Aquatic 2, designed to be left unattended after deployment, is waterproof in its tough durable case up to a depth of 500 m. The logger contains a user replaceable battery as the most cost effective and minimally disruptive solution. The battery typically has a life of one year, although this can extend or shorten depending on the usage of the logger. The status of the battery can be checked at any time using the Tinytag Explorer Software. A further key feature essential in today's world of speed of efficiency is the inductive download which also eliminates the need for connecting cables with sockets (a requirement of some loggers) that could be prone to water ingress in these wet environments. Data can be transferred from field to PC laptop safely and conveniently. The Aquatic 2 water temperature recorder is designed for today's field researcher and resource manager. It is practical, easy to configure and use, inexpensive and above all, it knows its environment. The Aquatic 2 data logger will not let you down.